Former NBA player, Dennis Rodman received Humanitarian Special Award at World Humanitarian Award (WHA). Dennis Rodman got this award because of his contribution on his effort to unite U.S. and North Korea. He is also known as the first U.S. citizen who got the chance to meet North Korea President, Kim Jong-un. Besides being a former NBA player Dennis also known with his TV series: The Rodman World Tour and some of Hollywood films; Double Teams and Simon Sez. 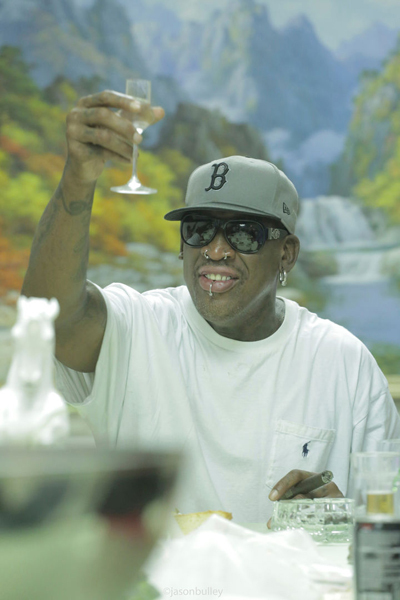 Dennis Rodman is involved in the movie Dennis Rodman’s Big Bang in PyongYang directed by Colin Offland. This documentary film tells us about what happened when he wants to improve relations between North Korea and the US by staging a historic basketball game between the two countries and the true story of what happened when Dennis took a team of former-NBA players to North Korea and staged the most controversial game of basketball the world has never seen. This movie itself received International Humanitarian Platinum Award in the Documentary Film category. World Humanitarian Award said that the reason behind the awarding of Humanitarian Special Award to Dennis Rodman is because of his contribution for peace in the region. Even though he used to be known by his controversial attitude in the past but he still wants to do something meaningful for humanity by trying to unite U.S. and North Korea. WHA also hopes that this award will give example to the next generations to keep on trying to make peace for the world despite of the difficulties and end result.